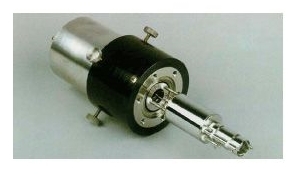 This ion gun is a compact and inexpensive design that comes with an ICF70 flange. It achieves high ion energy at a maximum 2 kV and high current density at a maximum 50 μA/cm2. An inert gas is injected into the vacuum chamber; and the gas in the chamber is then ionized and irradiated. Its power supply can be easily operated by analog control. The length from flange face to tip of ion gun can be freely changed as needed. •Adjustable length from flange face to tip of ion gun is freely changeable as needed. Sputter-cleaning of sample surface in the vacuum chamber, etc.